A device that allows heat from one fluid to be transferred to another fluid without the two fluids coming into contact. 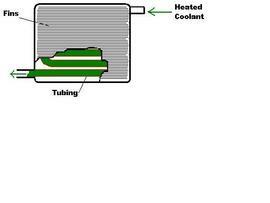 The heat is transferred through the walls of the pipe that keeps the two fluids separate. Older heater cores may be harder to find and therefore more expensive. It may make more sense to replace the entire furnace in an older system. Replacing a standard heater core costs $1,000 to $1,700. Installing a new electric furnace can cost $2,000 to $4,000.